Dr. Scharf and his Long Island based periodontal team are one of the best in the periodontal business when it comes to your dental health. 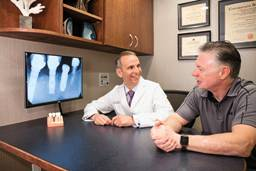 If you’re struggling with gum disease, if you’re in need of cosmetic reconstruction surgery or dental implants in Long Island, Dr. Scharf and his associates are highly trained to help you develop a personalized treatment plan. In practically no time at all, you can feel good about your smile again! Let us help make your periodontal health a priority again! Many gum surgeries and procedures need to be done by a highly trained specialist specializing in the periodontal field. You already knew that Dr. Scharf is great for dental implants and gum disease treatments, but did you know that Dr. Scharf also specializes in a few other procedures like Crown Lengthening for Restoration and Ridge Enhancement? Here’s what you need to know! Dr. Scharf and his Long Island based periodontal team are one of the best in the periodontal business when it comes to your dental health. Crown lengthening for restoration procedures are a periodontal specialty, and Dr. Scharf is one of the most experienced and highly educated periodontitis in the Long Island area! Additionally, he is one of the best around when it comes to performing crown lengthening procedures! Crown lengthening for restoration is usually recommended when a dental crown is needed, but there isn’t enough of the natural tooth remaining above the gum line to safely adhere the dental crown to the tooth. In these cases, your dentist may find that a crown lengthening procedure is needed. The procedure does exactly what it’s name lets on: it lengthens the existing tooth, and allows for a crown to be safely inserted in your mouth. The procedure can be completed by Dr. Scharf in only an hour, and requires a local anesthetic. Once anesthetic is applied, specialized instruments will be used to “recontour” the bone of the jaw. Only teeth needing this procedure will be affected, and any others should remain relatively unbothered. When the necessary amount of tooth is exposed for the crown to fit, the area affected will be sutured and bandaged to prevent any infection from occurring. After your procedure is complete, it is recommended that you return to Dr.Scharf’s office for a follow up appointment, and even the crown fitting. Our specialists will determine if the area is healing properly before sending you on your way. If you find that a crown lengthening for restoration procedure may benefit you and your dental health, Dr. Scharf is one of the best in the business! If you’re considering dental implants in Long Island, you may find that a ridge enhancement procedure could benefit you and your dental health. Ridge enhancement is usually performed for cosmetic purposes (the procedure is performed to fix the damaged gum ridge) and is a great way to correct any tissue defects caused by tooth loss. Often times, your gum ridge is exposed by the loss of a tooth either by accident or by a periodontal disease. When exposed, the affected gum will shrivel, creating a “ridge defect.” Ridge enhancement is used to restore the defected ridge of the gum, and helps makes your dental implants look a lot more natural! Dr. Scharf’s renowned ridge enhancement procedure has been published, and practiced world wide. His method is one of the most innovative when it comes to repairing and plumping gum ridges. The procedure is done in office, with the some of the best tools available, so there is no reason to worry! Ridge enhancement procedures may require sedation based on the comfort levels of each individual patient. Bone grafting or regeneration is often used during this procedure depending on each patient. Depending on the amount of tissue needed to repair the damaged ridge, donor tissues may be used, or through extra tissue in other areas of your mouth. To determine if a ridge enhancement is right for you, it’s important to first determine the need for a dental implant! Dental implants are often be required when teeth have been lost, and are a great way to restore functionality back to your mouth. Fortunately for you, Dr. Scharf specializes in ridge enhancement AND dental implants, making us a one stop shop! If you think you might be in need of a ridge enhancement or a crown lengthening procedure, call Dr. Scharf today to schedule your appointment! Whether it be through dental implants, ridge enhancement, crown lengthening, or by cosmetic surgery, Dr. Scharf and his highly trained dental associates are ready to help you fall in love with your smile again!